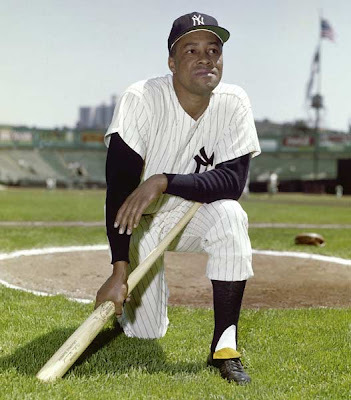 Elston Howard became the New York Yankees first African American ballplayer on April 14, 1955. He was the American League MVP in 1963, and he won Glove Gloves in 1963 and 1964. He came up behind the great Yogi Berra, and Berra was the league's MVP the year Howard arrived in New York. It would be several years before Yogi retired, so manager Casey Stengel used Howard as his back-up catcher, first baseman, and outfielder, just to get his bat in the lineup. He made his first All-Star team in 1957, without even having a solid starting position. He would go on to appear in nine consecutive All-Star outings. An interesting tidbit with Ellie's career is that he got a hit in his first major league at bat, and he homered in his first World Series at bat. Howard died in 1980 at the age of 51 due to myocarditis, a rare heart disease. In 1984 the Yankees retired Howard's number 32 jersey, and placed a plaque in his memory in Yankee Stadium's Monument Park.